Zak Storm Super Pirate is an awesome action and adventure game by Bandai America Inc. 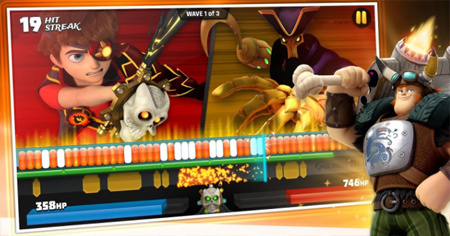 Your objective is to help Zak Storm to reclaim the Pirate King of the Seven Seas from Skullivar. Blast into adventure, battle super villains, earn new chests and powers, and become the ultimate super pirate. Level-up by exploring, battling and collecting treasure to reveal new worlds. Watch Zak Storm TV show and sync with app to unlock mini-games or rewards. If you get stuck in the game, check out the video walkthrough and gameplay for the game. This entry was posted in Android Games, iOS Games, Mobile Games, Walkthrough and tagged Zak Storm Super Pirate Cheats, Zak Storm Super Pirate Gameplay, Zak Storm Super Pirate Guide, Zak Storm Super Pirate Hints, Zak Storm Super Pirate Review, Zak Storm Super Pirate Solutions, Zak Storm Super Pirate Strategy, Zak Storm Super Pirate Tips, Zak Storm Super Pirate Walkthrough by Marvin. Bookmark the permalink.